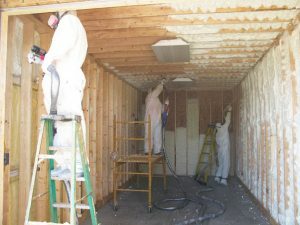 Spray Polyurethane Foam (SPF) or spray foam insulation is our specialty within the insulation division here at Lone Star Contracting (LSC). Since our certified sprayers manufacture and install our plural component system on site, you get a certified team who fully understands not only the product they are spraying but the science behind the application techniques and methods. With our dual proportioner mobile spray rigs we always have a minimum of two applicators spraying at the same time ensuring that we will finish your building on time, and on budget. We’re not your low budget, fly-by-night, working out of a garage, price-slashing kind of company. We take pride in our jobs and stand behind them 110%! Although we’re known for larger projects our services are perfect for just about any job you have, whether it’s residential, commercial, or industrial. Government and industrial projects often come with unique sets of specifications. 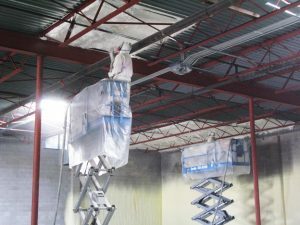 LSC’s extensive experience with insulating these types of facilities ensures that we will finish your building on time, and on budget. 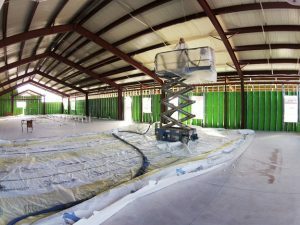 Our staff’s experience and expertise is a perfect match for your commercial or corporate project — especially when we use spray foam insulation. We’ll make sure that you get the highest possible energy savings and comfort from your building. LSC has proven expertise and experience with new home construction. Over the years, we’ve worked with premier homebuilders, so we know firsthand what it takes to get the job done right — and how to give the builder and the homeowner everything they need for great project results. Wool-type fiber glass is most commonly used as insulation in all types of buildings, from homes to commercial to industrial. Its unique properties make it work well for controlling temperature and sound. 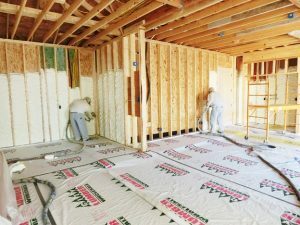 Blown-in (a form of loose fill) insulation is named for the installation process, which involves using a high-pressure blowing machine and a hose to distribute the insulation into the building. Our blown-in insulation is made of fiberglass, giving it advantages over other loose fill insulation materials.